ms Savor on the Danube River. Photo Courtesy of Tauck. The ms Savor began operating in 2014 along with the ms Inspire when Tauck introduced its Inspiration Class ships to the market. Like its sister ship, the vessel is 443 feet long and has more suite staterooms than any other river cruise vessels. As a matter of fact, 22 of its 67 cabins are full-size suites, which measure 300 square feet in size. Cruising along the Danube River, the ms Savor carries up to 130 guests and 39 crew members. Also among its staff are a Cruise Director and three Assistant Cruise Directors. The Tauck directors keep themselves busy making sure guests enjoy time onboard as well as time on land. They are behind the premium and often exclusive private tours offered to their passengers. Providing a first-class, 5-star experience is Tauck’s main objective. Despite the company’s high expectations in terms of service, the atmosphere tends to be quite relaxed. Some of the amenities onboard include a Fitness Center, Massage Room and Hair Salon, Putting Green and Jacuzzi. 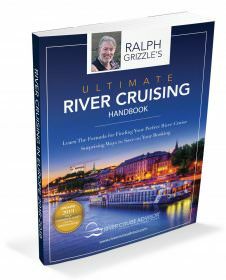 Check our Ralph Grizzle’s live voyage report from ms Savor in April 2015. There are 2 stateroom categories and 14 staterooms available on this deck. Both feature one or two windows rather than a balcony. Category 1 is a Standard Riverview Stateroom. There are 6 staterooms available located Midship. This category features two windows that does not open. The windows are 2 feet x 3 feet in size. Staterooms are 150 square feet. Category 3 is a Junior Suite Riverview Stateroom (or Loft Suite) and is one of the largest on the ship. The 8 available staterooms are located Midship. This category has one very large picture window (98 inches x 114 inches) rather than two smaller windows. The window opens partially on the top and spans one-and-one-half decks. This category also features a loft sitting area. Stateroom size is 225 square feet. See Ralph Grizzle’s My Loft Stateroom In Video. There are 4 stateroom categories and 49 cabins on this deck. It features the largest variety of stateroom categories as well as the most staterooms on the ms Inspire. Category 2 is a Standard Balcony Stateroom. There are 3 cabins available located Aft and Midship. Stateroom size is 150 square feet. Category 4 is a Standard Stateroom with a Balcony. There are 22 cabins available located Forward. Stateroom size is 190 square feet. Category 5 is a Junior Suite with a Balcony. There are 8 staterooms available located Midship. Stateroom size is 225 square feet. This is the largest size for this category in which a smaller version is available on Deck 3. Category 6 is a Junior Suite with a Balcony. There are 16 staterooms available located Midship and Aft. Stateroom size is 225 square feet. There are 24 cabins located on this deck in 2 different categories. Category 5 is a Junior Suite with a Balcony but a smaller version than the same category on Deck 2. There are 2 cabins available located Forward. Stateroom size is 225 square feet. Category 7 is a Suite with a Balcony. There are 22 cabins located Midship and Aft. Stateroom size is 300 square feet. This category along with Category 4 features the largest number of staterooms. All cabins on the ms Savor share some of the same luxurious touches. While the Suites have a few extra features, all staterooms have a few things in common, such as lavish bedding that is made with 400-thread count fine linen and hypoallergenic down-filled pillows made from mako cotton. Bathrooms feature baths and showers that are exquisitely designed with marble. Category 7 Suites have separate showers and bathtubs. In each cabin guests will find Molton Brown premium-quality toiletries, a Tauck exclusive, and terry-cloth bathrobes and slippers. Additionally, all cabins have mini-fridges stocked daily with water and soft drinks, 32-inch LED TVs, two chairs, desks, safes and individual climate controls. Category 7 Suites are considerably larger than most other staterooms and include a few extra features, such as breakfast room service, 2 french balconies, couches, two chairs, coffee tables and walk-in closets. There are several public areas aboard the ms Savor for mingling with others or engaging in activities. A few gathering areas include the Panorama Lounge & Bar on the Diamond Deck (Deck 3); and on the Sun Deck (Deck 4), there is a Putting Green and a Jacuzzi. Dining venues include the main Dining Room on the Ruby Deck (Deck 2), a Casual Dining area on the Diamond Deck (Deck 3), and a super casual Al fresco Dining option on the Sun Deck (Deck 4). On the Emerald Deck (Deck 1), guests can squeeze in a workout in the Fitness Center, enjoy the services of a Spa & Massage Room or have their hair professionally styled in the Hair Salon. And a couple of other public places to mention, include a Boutique and the Reception Desk on the Diamond Deck (Deck 3). Fare includes airport transfers. port charges, gratuities and unlimited beverages (coffee, tea, soft drinks, beer, wine & spirits). All staterooms have a river view. An elevator is available for passenger use. Free WiFi is available onboard throughout the ship. All staterooms aboard ms Savor are fitted with 220 volt and 110 volt outlets in the cabin and bathroom. 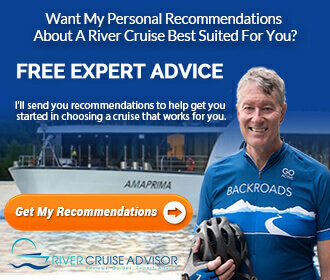 Want My Help With Your Tauck Cruise? Read all of our articles on ms Savor.